This week and next we will highlight fossils collected during our brief and successful expedition to the Upper Ordovician (Cincinnatian) of Indiana (with Coleman Fitch ’15) and Kentucky (with William Harrison ’15). We found what we needed to pursue some very specific topics. 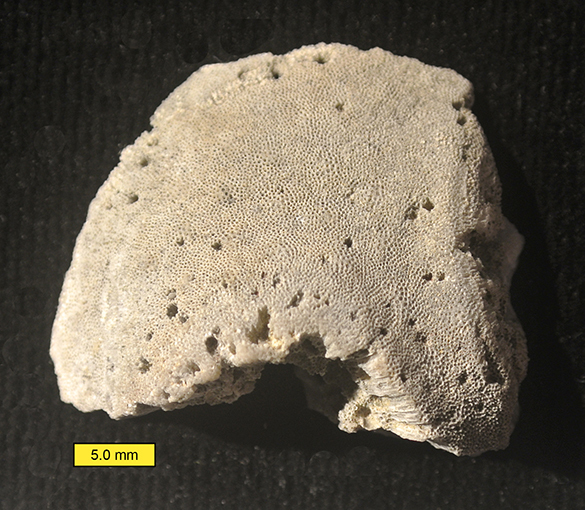 Above is a trepostome bryozoan collected from the Liberty Formation (we should be calling it the Dillsboro Formation in Indiana; our locality C/W-149) on IN-101 in southeastern Indiana (N 39.48134°, W84.94843°). You can see the regular network of tiny little holes representing the zooecia (zooid-bearing tubes) of the calcitic zoarium (colony) of the bryozoan. The larger, irregular holes (still pretty small!) are borings cut by worm-like organisms into the bryozoan skeleton shortly after the death of the colony. Flipping the specimen over we see the most interesting parts. 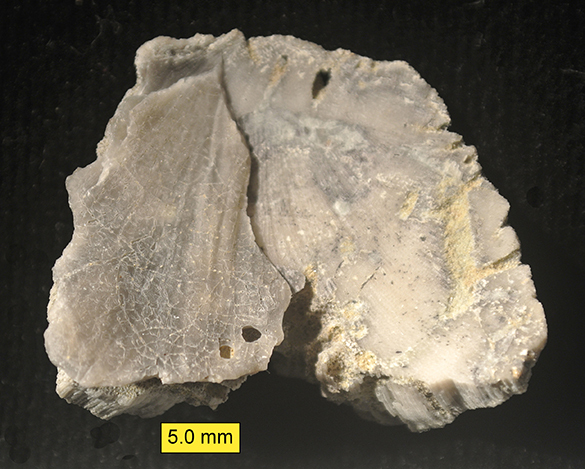 On the left is a remnant of the original calcitic strophomenid brachiopod shell that was encrusted by the trepostome bryozoan. On the right the shell has broken away, exposing the encrusting surface of the trepostome. We are thus looking here at the inside of a brachiopod valve and the underside of the bryozoan that encrusted it. This is just what we hoped to find for Coleman’s project on interpreting half-borings in brachiopod shell exteriors. 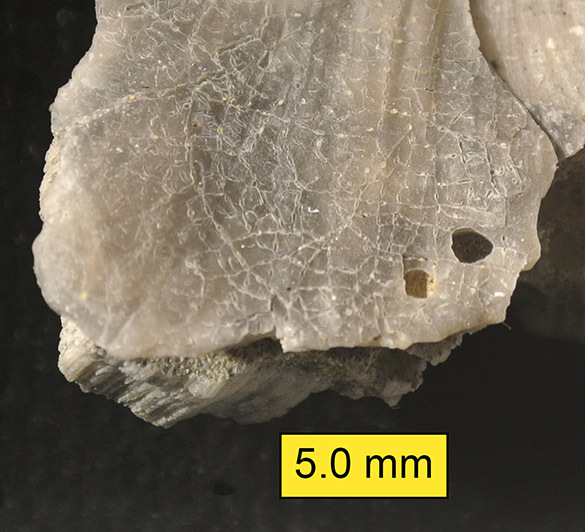 This specimen demonstrates two crucial events after encrustation: First, the borings in the bryozoan extended down to the brachiopod shell and turned sideways to mine along the shell/bryozoan junction (note half-borings in the bryozoan base on the right), and second, the bryozoan broke mostly free of the brachiopod shell, with only a bit remaining on the left. Somewhere there is or was a fragment of that brachiopod with an exterior showing half-borings and no bryozoan encrustation. Thus a brachiopod without bryozoan encrusters may have actually been encrusted at some point, but the bryozoans were later detached. We’ve added a bit to the uncertainty of the encrusting fossil record — even calcitic skeletal evidence on this small scale can go missing. We’ve also started on a good story about the behavior of the tiny critters that bored into this shelly complex. A bonus in this specimen can be seen in this closer view of that brachiopod shell interior above. That branching network is a complex ctenostome bryozoan boring called Ropalonaria. This is a particularly well developed specimen with thicker, shorter zooids than I’ve seen before. This kind of boring is the subject of a previous Fossil of the Week entry. Coleman has a great start on his Independent Study project with specimens like these. He has a lot of sectioning and adequate peeling ahead of him! Brett, C.E., Smrecak, T., Parsons-Hubbard, K. and Walker, S. 2012. Marine sclerobiofacies: Encrusting and endolithic communities on shells through time and space. In: Talent, J.A. (ed.) Earth and Life, International Year of Planet Earth, p. 129-157. Springer. Pohowsky, R.A. 1978. The boring ctenostomate Bryozoa: taxonomy and paleobiology based on cavities in calcareous substrata. Bulletins of American Paleontology 73(301): 192 p.
Smrecak, T.A. and Brett, C.E. 2008. Discerning patterns in epibiont distribution across a Late Ordovician (Cincinnatian) depth gradient. Geological Society of America Abstracts with Programs 40:18. Wilson, M.A., Dennison-Budak, C.W. and Bowen, J.C. 2006. Half-borings and missing encrusters on brachiopods in the Upper Ordovician: Implications for the paleoecological analysis of sclerobionts. Geological Society of America Abstracts with Programs 38:514.